The Aam Aadmi Party is all set to inaugurate the new Signature Bridge today in Delhi but the picture shared by the AAP’s official Twitter account is of the illuminated Erasmus bridge in Rotterdam. 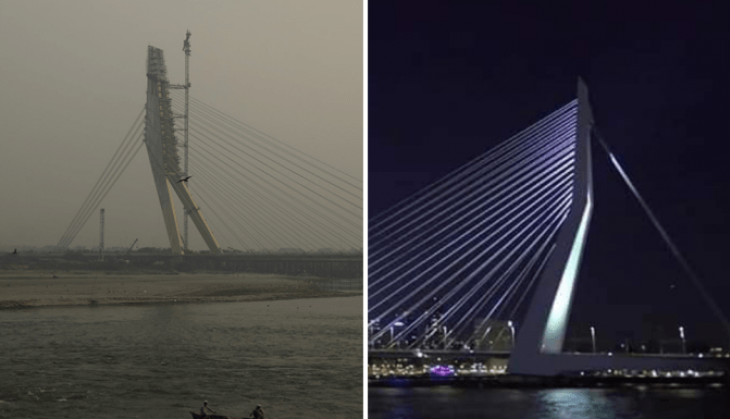 AAP on Saturday tweeted the images of a bridge which was illuminated by lightings and said that these are the pictures of the Signature bridge, going to be inaugurated today by the Delhi Chief Minister Arvind Kejriwal and deputy CM Manish Sisodia. After this post, it was pointed out by the Twitter users that these pictures doesn’t belong to the upcoming Signature Tower Bridge but of Erasmus Bridge, Rottedam. And it became a point of discussion for many in the political battlefield, wherein at the inauguration, any BJP leader is not invited. Bagga also added that the full-page ad published in most of the newspapers today are also different from the real Signature Bridge. Ousted Aam Aadmi Party leader and former minister Kapil Mishra claimed that the 98% work of the bridge got completed during his tenure and deputy CM Manish Sisodia managed to carry out only 2% work.